We are the experts in travel and tourism industry of Mongolia our clients are often amazed to learn that well over 30 percent of what we do consists of privately arranged trips, location services for the media, and a wide range of tourism consulting. Private Journeys are hand-tailored to match the specifications of our clients. If you have travel dream, or just want to tinker with one of our itineraries, please call one of our enthusiastic managers. All tours designed to fit your budget, tastes, and interests. Send us your requests and we’ll reply with a detailed suggested program and a price -” all with no obligation. Please ask for details. Tsogt studied in Raffles Institute (studies in English) in Ulaanbaatar. Equipped with many talents - guides, drivers and local guide for horse riding and assistant marketing manager. He is our experience as employees at all levels. He has initiated the idea of creating a fund that helps rural area of herder people. Foundation was established in May 2015 and the activity successfully. 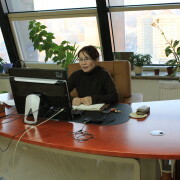 Ms. Anna is an experienced operations executive with over 20 years of experience in the tourism field and was a founder of Mongol Khaan Travel company in 1998. She have completed her studies in Germany 1996. Her responsibilities have included the commissioning and operations management as well as processing travel all around Mongolia. Mrs.Nyamsuren.T is working in Mongol Khaan Travel since 2008 as a Camp marketing manager. She has the responsibility to organize camp reservations and camp supply management. Nyamsuren plays in a major role to deliver quality service at Princess Lodge, by focusing on quality food and clean standard service, staff training etc. operation such as providing high quality on time service. She rewarded as an ace worker in 2016. Ms.Otgon-Erdene is working in Mongol Khaan Travel since 2008 as a tour manager. She has a responsibility to organize the company main service operation such as providing high quality on time service. Mrs.Gantulga.T is working in Mongol Khaan Travel since 2010. Gantulga plays in a major role to deliver quality service at Princess Lodge, by focusing on quality food and clean standard service, staff training etc. operation such as providing high quality on time service. She rewarded as an ace worker in 2015. Ms. Mir is the person that will be behind the desk answering all the questions you may have before your trip. She will fulfill your travel needs when you communicate with Mongol khaan Travel. She assists, communicates, sells the tour packages and was recently nominated to LOVE NOMAD FAMILY FUND Director. Enkhee is professional accountant and working as accountant over 25 years. She joined Mongol Khaan travel in 2010 spring. Enkhe deals with calculating tour prices and company everyday operation financial matters. She speaks fluent Russian and reasonable English. He is a reliable local guide at the Princess Lodge in Khan Khentii strictly protected area. He is responsible for the horseback and ox-cart tour itineraries. Lagshmi is student of Medical University of Mongolia. She fluency at Russan and English. Lagshmi is brand tour guide for our Polish clients. Many of our clients adores her enthusiasm and knowledge of Mongolia its customs and traditions. Highly skilled and professional cook during tours. He hosts you and organize while lodging at Princess Lodge. He has finished his Bachelor-Management of international tourism now working in full time at Mongol Khaan Travel. He is active well educated young leader. Member of the Mongolian bicycling team who made a world round trip. He has plenty of expierence of cycling throughout Mongolia with a tourist. He speaks fluent in English and German and works in one of the biggist company‘s accounting manager. Altanbayar love working as a tour guide in the summer time, since it’s great vacation for him as well. his knowledge and great exprience with dealing different countries tourist lead a lots of good feedbacks to us. He is a professional, knowledgable, experienced guide who is fluent in English and Russian.